The Parallel Butterfly FFT IP Core provides efficient continuous data FFT calculations at the rate of multiple points per clock cycle. 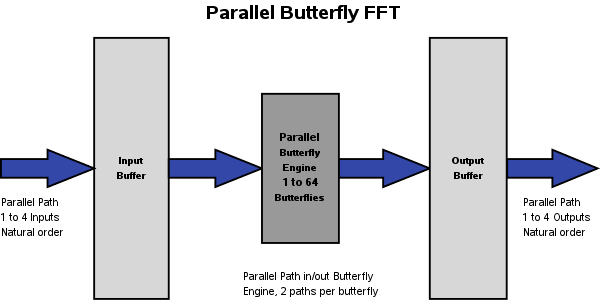 A bank of parallel butterflies executes the FFT one rank at a time on multiple I/O streams. Massively parallel butterfly architecture, from 1 butterfly up to the full logic capacity of the target device. Our FFT core is based on radix-2 reduction, which results in a very efficient implementation capable of any power-of-2 length FFT or IFFT (see also our FFT Datasheet or our Floating Point FFT Factsheet). A sample of the FFT ParaCore parameters used to build the DE FFT IP Core. Please feel free to contact us with any FFT core questions or comments.